Wanting to fly is a dream of many little kids. Assen Andonov, born in Bulgaria, dreamed of flying a plane as a child. Growing up in the 1980s, Andonov would constantly be reminded of his dream because of military flyers displayed around town. Little by little, and despite tensions in his home country during the Cold War, Andonov made his dreams a reality. In the 1990s, he built his first airplane. At the age of 32, and after his sixteenth attempt, Andonov won the green card lottery, allowing him to move to the United States where he became a pilot for a commercial airline. After several years of living in the United States, Andonov launched his own company, Assen Aeronautics, and, with the help of FIU students, the Assen A1 flying hover bike. 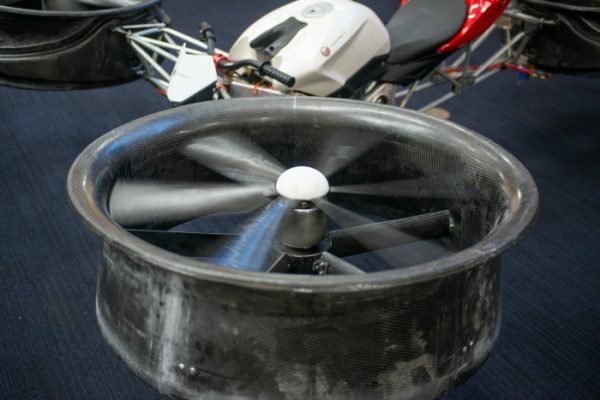 The Assen A1 bike weighs 100 pounds and can potentially fly up to 10,000 feet. It is computer-controlled and has been designed for the common person who isn’t a pilot to use. Andonov was looking to expand his aerospace company with engineers when he attended a “Nerd Nite” event in Downtown Miami in 2017. “Nerd Nite” is a monthly networking event for technology aficionados and is held in more than 75 cities worldwide. At that event, Marcus Herndon, an FIU mechanical engineering doctoral student, also networked with several attendees discussing his research on high-efficiency lithium batteries. Andonov and Herndon never met at the event, but through word of mouth, Andonov received Herndon’s contact information. Herndon was on board to help in any capacity and he connected Andonov with more FIU engineers – John Gibson, an electrical engineering and computer engineering doctoral alumnus, and Lamar Burton and Micheal Adeyosoye, electrical engineering and computer engineering doctoral students. Assen Aeronautics team. From left to right: Lamar Burton, Assen Andonov, Marcus Herndon, John Gibson, Milena Andonov and Micheal Adeyosoye. “When I met Andonov in October 2017, he only had the propellers and the engine. Bringing my colleagues and friends together to create the team was actually quite rewarding, especially when we saw the final piece come to life,” Herndon says. The FIU engineers are also part of the Bridge to the Doctorate program, which helps underrepresented students obtain doctoral degrees in STEM fields by providing them with a full-tuition scholarship and an annual living stipend. “The Bridge to the Doctorate program gave me the resources necessary to excel in my graduate studies,” Gibson says. 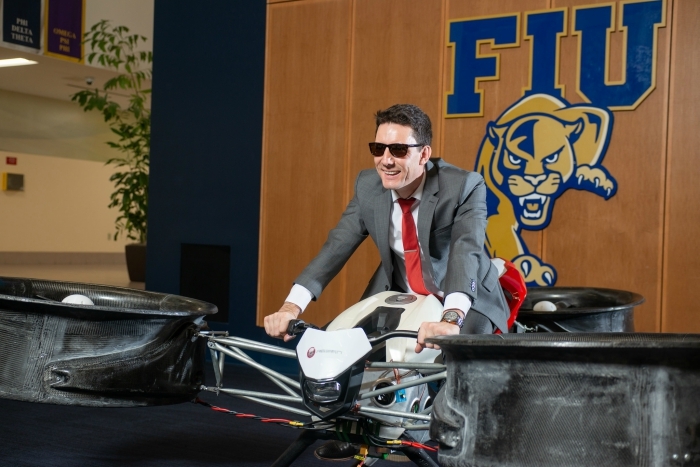 “Because of this program, I was able to come to FIU, eventually meet Burton and Herndon and through them I’m now a part of something more, the Assen Aeronautics team.” Gibson also happens to be FIU’s first Bridge to the Doctorate program graduate. The Assen A1 flying bike will be showcased at the EAA Airventure Oshkosh event, an annual gathering of aviation enthusiasts featuring more than 10,000 aircraft. The event takes place from July 23 through July 29 in Oshkosh, Wisconsin. “Andonov is a wonderful and brilliant man. I have so much faith in this project. This is the worlds ahead of transportation, you know what I mean?” Burton says.